Considering myself to be the only real normal, sane person on Earth, I accept the fact that I have a tendency (as every other person on the planet has if he/she were to honestly admit) to compare everyone I come in contact with to what I engender in my mind as being “normal.” There was a time in America when “normal” really meant “normal”, but I’m here to defend the proposition that in today’s world “abnormal” is probably more “normal” than “normal” is. You older folk probably remember those “normal” times when husbands worked, wives stayed home, kids behaved, boys got haircuts, girls didn’t, all our cars were American made, and at school students said a prayer over the intercom before lunch. We have now entered the Age of Enlightenment, however, and officially there is no more “abnormal.” Some folks may be “challenged” a bit, but through the lenses of the rose colored glasses we see everyone as “normal.” It is truly a wonderful world! Or not! I have been privileged from time to time in my extended lifetime to occasionally escape my All-American, apple pie, down home, flag waving roots and hobnob with the upper crust, the elusive elite, the more aristocratic bourgeoisie, if you will. Many times it was a very humbling experience which engendered from me a great deal of awe and respect for those people who honestly deserved to be amongst the elite. I am thinking in particular of a lecture I heard from a very prominent scientist describing his anthropological exploits and conclusions concerning evolution after thirty years of study. Although I did not agree with some of his conclusions, the depth of his knowledge concerning anthropology and science left me feeling educationally inadequate. Whatever success we mere mortals may enjoy on this earth pales, however, when compared to the crème de la crème of society…the artist. Particularly, the painter or musician, and, even more particularly, the painter…the person who can take buckets of basic color and create a Mona Lisa, a Rembrandt, or a Monet. Painters engender more envy from me than any other type of artist. We who claim some measure of musical talent can listen to Van Cliburn, Chet Atkins, or Jimmy Hendrix, and think to ourselves, “Man, with just a little practice, I could do that.” But when we look at the works of Monet, Rembrandt, or, yes, even Anniedeen Creel (my mom-in-law,) or even MORE amazingly, Brooke Downing (granddaughter,) we can only ask, “How do they DO that?” For the non-artist, artistry with a brush is an unattainable dream. I am convinced you either have it, or you don’t. 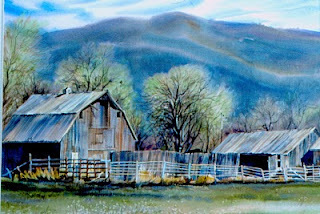 So when my mother-in-law, the aforementioned A. Creel, who had recently joined the Watercolor Art Society of Houston after years of making a name for herself as a premier watercolorist in the American Northwest, asked Shirley and me to give her a lift to the society’s monthly meeting, I happily volunteered. After all, it’s not often we common folk get to brush elbows with the elite, and even though we are not artists ourselves, we could claim to be relatives of a true artist and in doing so claim a measure of respectability whilst nibbling on an hor d’oeuvre during the presentations. My mother-in-law had won a ribbon in her first shot at competition in Houston, so we knew that instant respectability would be ours. The show and presentation was to be held at the society’s showroom and workplace on West Alabama in the nouveau artsy district of Houston. It is the main nesting area of the avant garte artist, and within its undefined borders dwells every imaginable species which would come under the general brand of “artist,” from true professional to rank amateur. From the evidence at hand, it appears the amateur artists far outnumber the professionals, and the job status for most would be “in between and not looking.” The show was to begin at 6:00 p.m. on a Friday evening (a wonderful time to be traveling Houston freeways…weekend traffic and all.) As luck would have it, the weather was miserable and raining. Mixing the rain, darkness, and traffic together does not a pleasant drive make, but make it we did, from our humble abode in Spring to The Woodlands to pick up Mother-in-law and then the forty mile trek to West Alabama and the show. The society’s center of activity is in a free standing building, nicely finished with a showroom downstairs and a workshop/classroom up. Considering the fact that Houston has over four million inhabitants, the size of the building and number of members of the society is relatively small, but then again, we are talking elite, so that’s part of the definition of elite, being relatively few in number. Entering the building, we found the activity bustling around the hor d’oeuvres, which consisted of the obligatory mini-sandwiches, cheese, crackers, chips, dips, cookies, and drinks….primarily wine. One cannot be an artist unless one can hold an hor d’oeuvre in one hand, a dash of wine in the other, and be able to gaze intently at a painting while nodding one’s head up and down slowly, as if communicating with the spirit of the painting’s creator. My mother-in-law would not touch an alcoholic beverage if someone put a gun to her head, so apparently she had some sort of “religiously exempt” card which allowed her to walk by the wine. I didn’t have any wine either because it makes me sleepy, and then when I sleep, I sleep like a baby, but when I awake I have a headache. WAIT A MINUTE! What I meant to say was if I did drink some I bet that’s what would happen. In the showroom were approximately seventy-five paintings of every imaginable subject, and, to the eyes of an amateur as myself, each one brought the same response…”How do they DO that?” Regardless of the impression you may get in this essay about my feelings toward artists, what I really feel is envy. Their skill in creating an image and invoking an emotional response is incredible. But I must confess, what I enjoyed doing most of the evening was watching not the paintings, but the people. Artists, by the very nature of their craft, are an individualistic lot. Every painting reflects its creator in style and substance, and, once the artist’s general style is recognized, his/her paintings can be spotted in any crowd instantly. This individualism extends to every facet of the artist’s persona, and that’s what makes artist-watching a very entertaining sport. Take for instance one of the first guys to stroll into the showroom about 6:15 . Tall guy, slim, fifties maybe, kind of craggily handsome in a rugged sort of way, he wore a French beret tilted jauntily over his right ear, a suede jacket, and a wool scarf wrapped around his neck. He wore these items the entire time of the show, nearly two hours, and the room was probably a toasty 74-75 degrees. If you had to draw a caricature of a French artist, his image is what you would come up with. I expected him to say, “Wiz plezhaire I am een ze room!” He was expansive when he talked, throwing his arms and hands around to emphasize his remarks. I think he imagined he cut quite a dashing figure. Following him came the nouveau riche woman, wearing a full length heavy fur coat, hair that was not styled at Walmart, and diamonds glistening around the neck. She was very friendly in a condescending way that rich people are friendly to poor folks, but she did eventually take off the fur coat and mingle with the commoners. In complete contrast to the fur coat lady was a fellow who from his actions was a familiar face around the society. He spoke to several members and chatted amicably with many of the artists. I’m sure he was a wonderful guy, but beyond his talent, whatever it is in the art world, he never learned how to dress. Unless you were close enough to hear his interaction and note his acceptance by others, you would have guessed he was homeless and had been wearing his clothes for a few days. Pudgy, wrinkled, non-matching, non-coordinating, sloppy dressing and unconcerned, he flitted about the room totally comfortable within his aura and unconcerned that he rather contrasted with the relative prim neatness of his peers. He reflected the unique characteristic of many of the gifted elite, the ability to focus one’s energy and attention on one’s most obvious talent and totally disregard anything else. Social interaction and personal appearance are optional concerns as long as the painting is complete. This leads to the second sloppy guy I saw at the meeting, and I am convinced he was a gate crasher. This fellow walked in, looked around, and instantly headed for the snack tables. He was coiffured in sneakers, ragged jeans, tee shirt, a full length well-worn dress topcoat, and baseball cap…and all of it needed cleaning. He could have used a haircut and shave, too. Anyway, he sailed through the hor d’oeuve line and filled a plate, and proceeded to walk around the showroom, looking intently at the paintings. He covered all seventy-five paintings in less than one minute, by which time his plate was empty also. Throwing his plate in the trashcan, he marched out the door, never to be seen again. For him, it was a cheap supper. He was a good actor, though; at least he went through the showroom and looked at the paintings. The artists probably thought that he was Pudgy’s (previous guy) brother. Intermingled through the audience were several examples of the successful, relatively young elite, those who frequent art shows to see and be seen. Impeccably dressed, carrying the obligatory dash of wine, they wandered from painting to painting offering insightful observations like, “That’s nice!” Some of the young women were wearing hats that probably cost more than my suits. I could not help thinking, “I bet there’s not a man in the room who knows how to change the oil in a car, or a woman (mother-in-law and wife excluded) who knows how to bake a cake from scratch.” The elite live on a different planet. Again, I am not being critical, just objective. On a positive note, there were also the People Who Get Things Done. They are the ones who make meetings, jobs, and activities succeed and are the backbone of every organization. In this case they were several ladies in the thirties and forties age bracket, neatly dressed, personable, who charmed visitors, passed on information, and kept things progressing to a scheduled conclusion. People Who Get Things Done always make you feel welcome and treat you as an old friend. Toward the end of the meeting, the awards, ribbons, and even money were passed out to the winners, along with the comments of the judge who...well...judged the paintings. The judge was supposed to be at the meeting but did not show up, and listening to her comments as read by the master of ceremonies, it’s just as well. Her comments reflected a grasp of watercolor about as deep as mine. Her comments were shallow, not detailed or descriptive, and indicated she disregarded technique, complexity, and style of the artists and just chose the paintings she liked personally. We agreed (Shirley, Mother-in-law, and myself) that the winning choices were not the best in the room and (naturally) that Mother-in-law’s painting should have been higher than fourth place. Just when I had finished reinforcing my opinion that all artists are…um…different, a couple walked up to Mother-in-law and introduce themselves as the Baileys. Very friendly couple, the woman especially was very chatty while the man introduced himself but sort of stood quietly. I recognized the name from a couple of beautiful paintings of calla lilies that were hanging, and I thought to myself that the lady was a very talented artist. Mr. Bailey, however, appeared amazingly…normal. He was neatly dressed in slacks, shirt, and jacket, shaven, and hair neatly combed. If fact, his hair was combed in the same style as mine! Instantly I liked him, and decided we were both blessed with being married to very talented women (I hope SHE reads this.) I decided that this guy could probably change the oil in his car if needed. Finally, a fellow normal person! But the shocker came a few seconds later! It turned out that he was the painter in the family, not his wife! He had painted the calla lilies at the prodding of his wife, and I can tell you, although they did not win ribbons, they should have...and I’m not a flower painting person. So the upshot of all this is I’ve had to revise my opinion of gifted people a little and give grudging credence to the proposition that it is possible to be gifted, elite, and, yes, normal. Kelly Bailey has demonstrated that it is possible, and has encouraged me to believe someday I may ascend from the normal class into the gifted elite. But when I reach that lofty social position, I promise that I will remain friendly with my old, normal friends and occasionally borrow money from them to maintain a relationship. It was a rainy, treacherous drive back to The Woodlands, but we safely deposited Mother-in-law at her apartment and splashed our way back to our own home. I was relieved when we passed through our gate. One hundred miles of rain, darkness, freeway, and traffic can create tension. But it was an enjoyable evening.